At 5pm tonight, a project of design excellence opens in Auckland’s CBD. It is also a beautiful and solid reclaiming of public space. You are invited to tonight’s unveiling of the refurbished and repurposed Ellen Melville Centre and Freyberg Place. 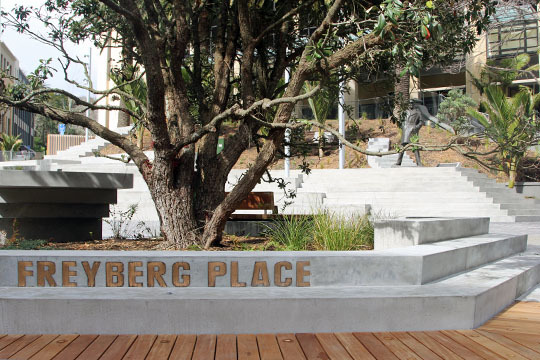 Join the celebrations as the doors to central Auckland’s newest (and only) community centre are officially opened, and a reimagined and reinvigorated Freyberg Place is revealed. The project is the latest addition to a growing network of public places and spaces transforming downtown Auckland, providing for people and communities, to land, to linger, to occupy and to live. The Auckland Design Manual will be taking an in-depth look at this rare and radical reaffirmed public occupation of space in the city centre in the coming weeks. Until then grab your party hat and join the festivities. ← EXTENDED – What’s your new Auckland home? Explore the future of Auckland’s housing in Aotea Square (6pm 13th – 10am 22nd Sept).